In PLATE-BUCKLING, the reduced stress method is implemented. This article provides information which can be used for the design of stiffened buckling panels. Generally there are two options for determining buckling values of stiffened buckling panels. First, you can obtain the values directly from diagrams by using the existing boundary conditions in accordance with  and . Second, you can perform an eigenvalue calculation. The eigenvalue calculation determines critical load factors for the respective existing stress. By recalculation using critical buckling stress, you can then obtain the buckling values. 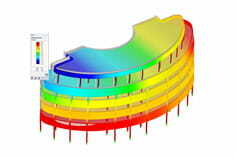 Evaluation of the determined mode shapes is essential for the design. The buckling analysis should be performed for the stiffened panel and the corresponding buckling mode will display the global failure mode. The first determined mode shape can be used to assess whether there is the buckling of a subpanel, panel section, or stiffened plate. 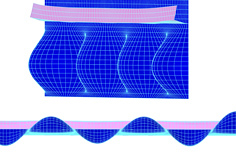 The following example shows the first mode shape for the subpanel buckling above and below the longitudinal stiffener. At this point, it must be decided whether the corresponding subpanels are to be analyzed separately or if a global mode shape should be selected from the higher mode shapes. PLATE‑BUCKLING provides the option to determine up to 50 mode shapes. The following figure shows Buckling Mode No. 17 for the global failure of the stiffened panel. Based on the design of stiffened plate and by using the corresponding global mode shape, the calculation of the critical plate buckling stresses according to , Appendix A, can be performed using the buckling values and the critical buckling stress. The calculation method for one or two longitudinal stiffeners in the compression zone is based on the elastically supported equivalent member. The critical buckling stresses determined by extrapolation to the compression edge result in the critical plate buckling stresses. As previously mentioned, the first mode shape displays the local buckling mode and therefore is not governing for the design of stiffened plate. In this case, you can now explore an alternative design process. In a separate design case in PLATE‑BUCKLING, the corresponding subpanel is defined with the corresponding dimensions, boundary conditions and loads. The buckling analysis is then performed for the unstiffened buckling panel. PLATE-BUCKLING allows not only for the analysis of up to 50 mode shapes, but can also be useful for all corresponding buckling analyses. In the following example, the governing mode shape (Mode No. 17) is used for the design of the subpanel. It should be noted that as an alternative to Option 2, you can perform the analysis using the analytical calculation method for determining critical buckling and plate buckling stresses as described in Appendix A.2. However, since the global mode shape of the subpanel could be clearly defined, this is not necessary for this example. Manual calculations of stiffened buckling panels can be very difficult and time‑consuming. In many cases, the analysis may not be possible without extensive numerical calculations. PLATE‑BUCKLING software provides a solution for such needs and allows for efficient plate buckling analyses. European Committee for Standardization. (2016). Eurocode 3: Design of steel structures - Part 1‑5: Plated structural elements. EN 1993‑1‑5. Brussels: CEN. Klöppel, K. & Scheer, J. (1960). Beulwerte ausgesteifter Rechteckplatten, Band 1. Berlin: Verlag Wilhelm Ernst und Sohn. Klöppel, K. & Scheer, J. (1968). Beulwerte ausgesteifter Rechteckplatten, Band 2. Berlin: Verlag Wilhelm Ernst und Sohn.